Jack Sheinkman... , a former head of America’s largest clothing-workers’ union and a leading strategist of the post-Vietnam-era labor movement, died in New York in 2004. He was 77. Every year since the mid 1960s the Indiana based Eugene V. Debs Foundation holds Eugene Debs Award Banquet in Terre Haute, to honor an approved social or labor activist. The 1985 honoree, was Jack Sheinkman. 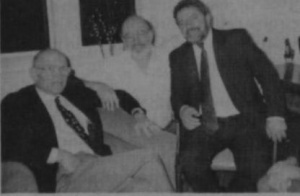 In 1986, Jack Sheinkman was a member Democratic Socialists of America. In May 3-6, 1990 the National Rainbow Coalition held a successful conference in Atlanta, attended by over 1,000. On March 18 1994 President Clinton appointed Susan Hammer, Fu-Tong Hsu, Bernard Rapoport, Jack Sheinkman and Paula Stern to the Advisory Committee for Trade Policy and Negotiations. 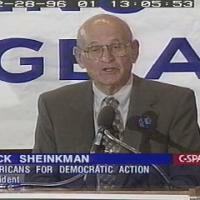 In 1996 Jack Sheinkman, Americans for Democratic Action President was one of the original 130 founders of Campaign for America's Future. This page was last modified on 5 August 2016, at 17:10.